The Spanish Asturias is a region with a complex mountainous terrain. A landscape of almost inaccessible mountains and deep valleys, which humans have inhabited for thousands of years. Towns and villages are scattered across the region, from the Cantabrian Sea to altitudes above 1 400 m in the Cantabrian Mountains. The human population is spread across the valleys, which is also reflected by the way people manage their livestock. Most of them are characteristic smallholdings. Nowadays, the people keep their livestock on thousands of small parcels, while agriculture nearly disappeared. Keeping small scale livestock is an important husbandry in this type of land, and heavily subsidised by the European Union through the Common Agricultural Policy (CAP). In the Asturias region, large areas of open land and meadows are scarce. You find large pastures, the so-called ‘summer pastures’, normally in the high mountain areas. This is where the farmers take their animals to spend the snow-free months there, usually between June and September. However, this traditional husbandry is disappearing, especially because the high mountain areas not not easily accessible. In many cases, vehicles are not able to reach these pastures at all. Until forty years ago, shepherds always accompanied the livestock in these high mountain areas. The shepherds lived in precarious mountain huts, the so-called ‘brañas’, during those summer months. Nowadays, this ancient tradition completely disappeared and livestock management changed dramatically. Livestock owners transport their livestock up to the high mountain areas, leaving them without any surveillance. Only in some areas, herding dogs join the livestock herds. Yet, people use this kind of protection also less, as the dogs need food regularly. This implies that the livestock owner has to climb up to the area several days a week. In October the people gather their livestock down in the valleys, distributed on small meadows. In most cases, the livestock stays there without any proper protection until the end of May of the following year. The wolf is present in the Asturian mountains all-year round. According to the latest estimations, there is a population of about 30 family groups, possibly between 200 and 250 individuals. Normally, the wolves are feeding on abundant wild ungulates, like roe deer, red deer and wild boar. However, is the Asturian region this is not the case, because wildlife numbers are low due to sport hunting. As a result, a larger part of the wolf’s diet is carrion. Mainly domestic animals that diet by natural causes, become part of the diet of vultures, bears and wolves. There are over 100 000 cows in the Asturias. A considerable part of them graze freely and are not kept for the production of meat. The possibility to protect them against wolf attacks is very low. The young farmers, financially supported by the CAP are not professional farmers. Most of them have their jobs in the city. They do not employ any livestock protection, neither dogs nor electric fences. In fact, farmers claim that red deer is likely to destroy the electric fences. As a result, these ‘city’ farmers check their cattle once a week or once a month. Similar occurs at the widespread horse farming activities in the Asturias. Horses roam free and unprotected in the mountains throughout the year. 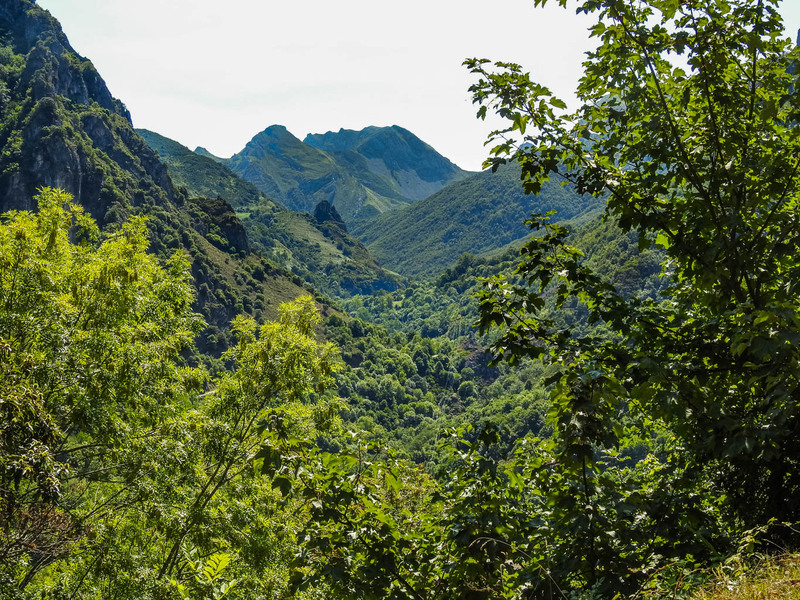 In generally, there is a very low level of livestock protection for livestock that is grazing freely in the mountains and valleys of Asturias. Only a few herding dogs are present in the high mountain areas during summer. In winter, livestock owners keep their animals in small and scattered parcels of 1-2 hectares in the valleys. Therefore, farmers cannot have 2 or 3 herding dogs with each herd. Many farmers would need 10 to 15 dogs to protect every parcel. Not a single farmer is willing to keep that amount of dogs as their maintenance costs are too high. Not to mention the additional expenses to get to the different herds in order to feed the dogs. This gets even more problematic when the farmers have to care for the dogs during the summer months in the high mountains. As the horses roam freely over thousands of hectares, electric fences are not the solution for proper protection. At the smaller parcels in the valleys, cattle is fenced in by traditional low stone walls or dense hedges and vegetation. It is said that electric fences are not feasible in these territories, as wild animals are tearing them down. Traditionally, the protection in Asturias depended on shepherds. They lived permanently with their cattle, in the mountain huts during summer and the valleys during winter. This kind of protection disappeared. Nowadays, the modern ‘city’ farmers want livestock keeping to be effortless. They do not consider expensive solutions, like maintaining dogs, or something that requires extra work. In fact, most of these livestock owners do not event want to put in extra effort to protect their animals. It is thus very important to find new technological ways to improve livestock protection in Asturias. Due to the presence of wolves, it is important to have a proper livestock protection system against large carnivores. Some of the newest technological protection measures that people are testing for their effectiveness, includes special deterrent collars. These collars could real the attack of predators, using high frequency sounds.